A FEW RECENT SHOTS FROM THE LOCAL PATCH. Been over to the local patch a couple of times recently (Friday morning and this morning) and have struggled to find anything decent which is not a surprise this time of year. Best spot was a Black-tailed Godwit on the CP pool on Friday which annoyingly would not come close.Even more annoying on the same day the Grasshopper Warbler showed very well on the orchid field but only after I had left. There were 13 Common Terns on the CP pool this morning the adults feeding up the young before heading off to Africa. WOW A GRASSHOPPER WARBLER AT MARSH LANE. Popped over to Marsh Lane this morning pretty early to avoid the forecast rain.Arrived at 8.45 AM to find it dry but a little cloudy. Saw two Common Sandpipers and a Little Egret on the CP pool but it wasn't till I got to the end of the causeway and went through the gate there that things got really interesting. I had been hearing what I thought was a grasshopper chirping away when I was still on the causeway but when I went through the gate I thought "My God ! That is one loud grasshopper." When I was half way down the path to the Oak hide I knew it was in fact a Grasshopper Warbler because the whirring was so loud and long.But where was it ??? Other recent shots from Marsh Lane included young Common Whitethroats and Chiffchaffs. A LINNET SAVES THE DAY. Went over to Marsh Lane this morning getting there not long after 9.00 AM.It was a lovely morning very sunny and not yet too warm. Had a good walk round but things were very quiet and it wasn't till I caught up with a cracking looking Linnet along the causeway that I used the camera.The Linnet saved the day. Didn't get a good look at Mom with 9 chicks the other day at Marsh Lane but I'm hoping she is a Shoveler. This morning I decided to check out some of my local spots.Went over first to the NT property at Baddesley Clinton to see if the Spotted Flycatchers were still about.The chicks must have fledged because none were showing.Did see a Grey Wagtail alongside the moat though. Then I spotted something a bit gruesome on the garden side of the moat.I thought Mallards were vegetarians so I was very surprised to see this female trying to eat what I first though was a frog but is in fact a bird. Went to three other of my local spots but drew a blank at all of them and never saw a bird at any of them. A STUDY OF MARSH LANE SEDGE WARBLERS. I've put this blog under a fancy heading this time to cover up the fact that on yesterday morning's visit there the only bird I managed to take a shot of was a very friendly Sedge Warbler on the reeds in front of the N Causeway hide.This then allows me to post a few more shots of a Sedge Warbler than I would normally post. Now moving away from Marsh Lane Reed Warblers I recently received a couple of shots from 2 family members both non birders and both using the camera on their phones. The first shot was taken by my brother whose wife's cousin lives in a barn conversion in the wilds not far from Studley. 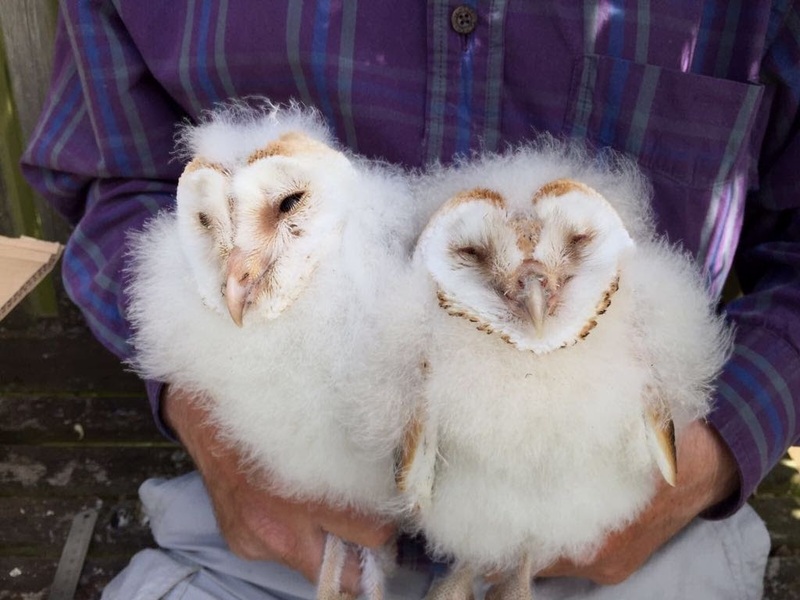 Barn Owls have nested in the barn again this year.They can say they have Barn Owls nesting in their house.How cool is that ! ! !This shot was taken very recently when the RSPB turned up to do some ringing. 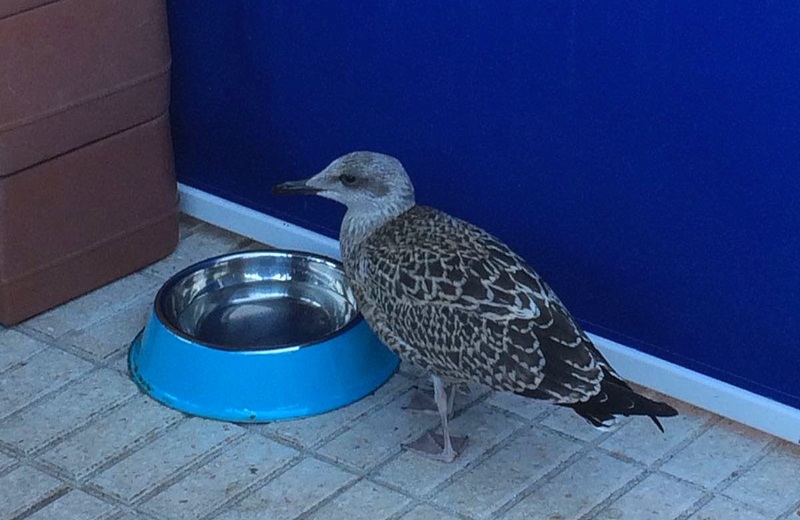 This shot was taken earlier in the week by my youngest son who is holidaying with his French fiancee in Gibraltar.Taken on his hotel balcony.I'm told it is a Yellow Legged Gull. GREAT WHEN YOU FIND THE BIRD YOURSELF. As I've said before I love Spotted Flycatchers but this year I've struggled to catch up with them and only a tip from John Hunt put me onto a pair at Charlecote Park a week or two ago. I found a pair last year in the churchyard at the NT property at Baddesley Clinton but this year after checking it out several times all I've seen there has been one and then only for a few seconds. As Baddesley Clinton is very local to me and as I'm a NT member I often tootle over there for a bit of birding.I popped over this morning but instead of going to the churchyard I decided to check out the grounds.Within a few minutes and just past the house moat near the stream I saw a Spotted Flycatcher.How good am I ! ! ! Alright then.How lucky am I ! ! ! The pair favoured the rather gloomy area round the stream so pics unlike when they were in the churchyard last year were a bit tricky to get.Had to be patient and I managed some decent ones. And a Treecreeper that ventured into the SF's area this morning.